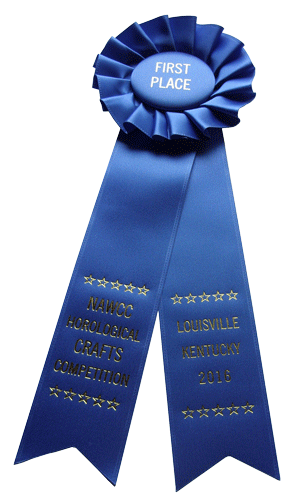 This one-of-a-kind mantle clock was designed, built, painted and carved for the 2016 NAWCC Crafts Competition in Louisville, Kentucky. 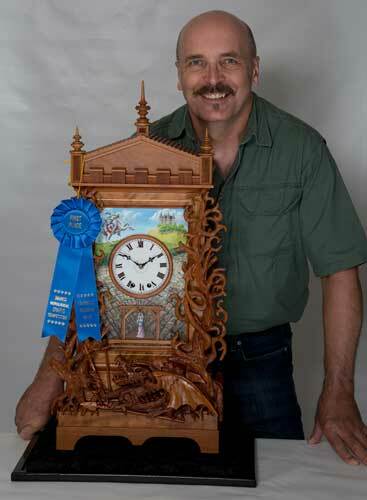 The clock won First Place in the Carved Clock category and Second Place in the Wooden Clock Case Design category. 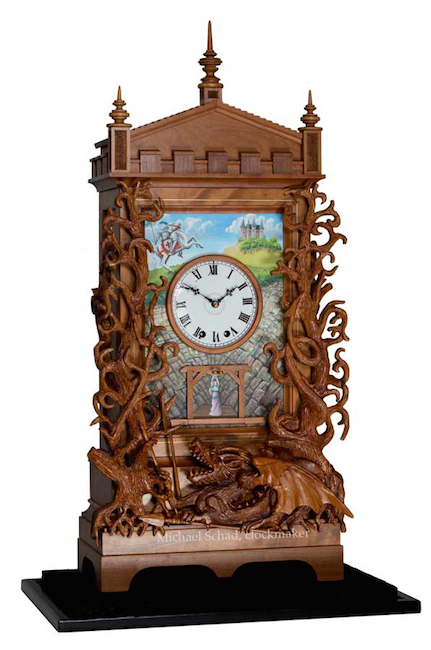 The clock was inspired by the legend of St. George and the Dragon and captures the moment of St. George's arrival. The princess is bound below him in the dragon's lair awaiting her death. The dragon is wrapped in the trees beneath and surrounding the maiden. 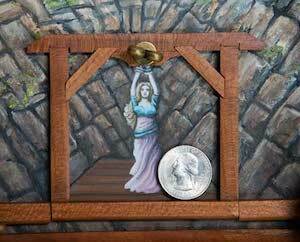 The scaffold supporting the fair maiden is the hidden doorway to access the winding key and pendulum. 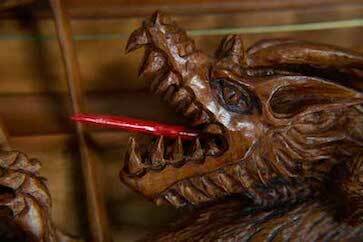 The dragon's tongue flicks out once on the half hour and then flicks out multiple times on the hour with the gong to indicate the time. The clock's painted background is done in bright, cheerful colors to contrast the dark, dying world of the dragon that frames the scene. The clock case and carvings are of Missouri Cherry wood rescued from an old barn. The clock uses a German 8 day spring-wound, brass movement and has a porcelain dial. 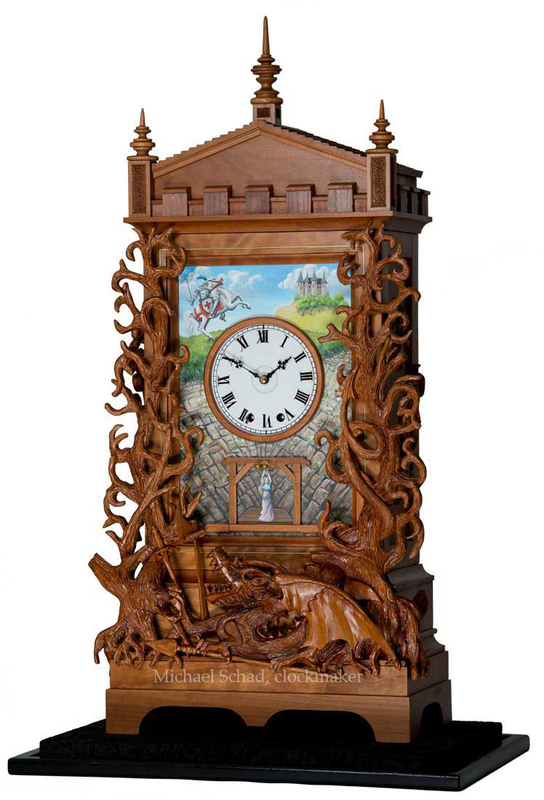 This clock was shown in Fine Woodworking Magazine, Feb 2017 , Gallery. Dimensions: ~ 32" tall, x 17" wide x 11" deep. 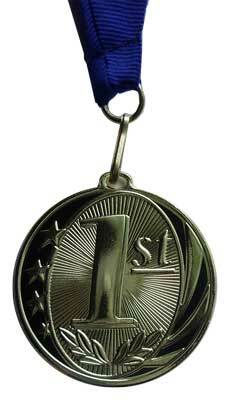 Cost $10,000, plus delivery and set-up.